In the first article in our series, we talked about the creation and the miraculous birth of Jesus (Peace Be Upon Him (PBUH)). This led us to another question that needs to be answered as well. Based on what we mentioned in the previous article, is Jesus (PBUH) a god? In this two-part article, we will discuss this point and see what we will get. Let’s first try to answer our discussed question through asking another question: Is it logical that a god prostrates to another god?! As for human beings, the position of prostration is bending down, falling on the face, and putting the forehead on the ground. Logic tells us that to prostrate to God in this way means that you submit to God, worship and obey Him, because you need Him and seek His help. Since God is Exalted and Almighty, does He need anyone? Does He need to pray or prostrate to anyone?! In the Bible, it’s mentioned that Jesus, as well as other prophets before him, prostrated and prayed in the same way in which Muslims pray and prostrate today! Then Jesus went with his disciples to a place called Gethsemane, and he said to them, “Sit here while I go over there and pray.”” [Matthew 26:36]. 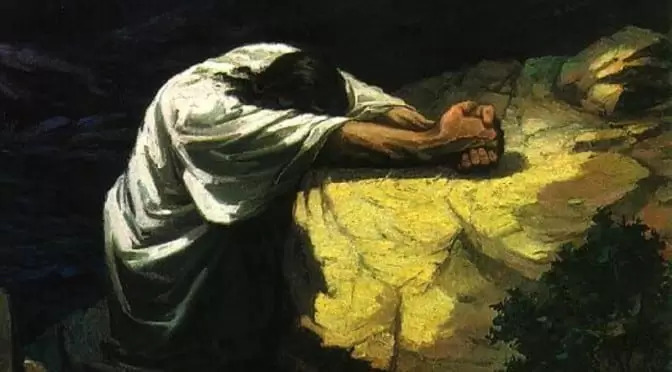 And he [Jesus] went a little farther, and fell on his face, and prayed, saying, “O my Father, if it be possible, let this cup pass from me: nevertheless not as I will, but as thou wilt.”” [Matthew 26:39]. Let’s imagine this situation. Jesus is standing in a humble submission, he is falling down on the ground, his forehead is touching the ground in a complete submission while the drops of sweat are dropping down from his forehead. Is it logical that this position could represent characteristics of a god?! Here, we can realize that Jesus prayed and prostrated to God because he can’t hold for himself harm or benefit. So, he refuged to God in the time of hardships to help him, to protect and save him, and to take him out of the calamities and hardships. He refuged to the only one Whom he believes can do all of this, God. Yet a time is coming and has now come when the true worshipers will worship the Father in the Spirit and in truth, for they are the kind of worshipers the Father seeks.”” [John 4:21-23]. If it’s only the servant who needs God and prostrates to Him, while God never needs anyone nor prays or prostrates to anyone, then, is it logical that Jesus is God?! One of those days Jesus went out to a mountainside to pray, and spent the night praying to God.” [Luke 6:12]. Do not work for food that spoils, but for food that endures to eternal life, which the Son of Man will give you. For on him God the Father has placed his seal of approval.” [John 6:27]. “Paul, an apostle—sent not from men nor by a man, but by Jesus Christ and God the Father, who raised him from the dead—” [Galatians 1:1]. “Grace and peace to you from God our Father and the Lord Jesus Christ,” [Galatians 1:3]. And in many other positions, it has been explicitly mentioned that God is “the Father”. But in any position, it has never been mentioned that God is the son “God the Son”. It has never been clearly and explicitly mentioned that Jesus, the son, is God (“God” not “Lord”, since not every lord is a god!). If “the son”, Jesus, is God as well, why this has not been clearly and explicitly mentioned too?! At that time Jesus said, “I praise you, Father, Lord of heaven and earth,”” [Matthew 11:25]. Based on what we mentioned in the previous point, God is the Father, then the Father is God of Jesus Christ. The Father, God, is the Creator and Artificer of all things. Then, the Bible is telling us that God is the Father and the Father is the Creator. This has been clearly and explicitly mentioned about the Father, while has never been mentioned about the Son, which makes us ask ourselves: Why?! Why this has not been mentioned about the Son, Jesus, likewise if he is God too?! In the second part of this article, we will see together whether or not Jesus (PBUH) told the people and his followers to take him as a deity. So, stay with us!